Lady Christl is an early potato variety which is recommended time and time again in many of the gardening forums. It has also gained the coveted RHS Award of Garden Merit. It's not difficult to see why, it has both taste and good looks which impress most people. If you can't eat the entire crop as an early then it can be left in the ground for two or three weeks longer to be harvested as a second early. It keeps in storage well for an early variety. We recommend it highly and it has very few failings. Good for gardeners new to potato growing. The parents of Lady Christl are WS73-3-391 x Mansour. It was bred in the Netherlands in 1985, making it one of the more recently introduced varieties. The potatoes are very clean looking with yellow to cream skins which have almost no eyes so peeling, if required, is simple. The skins are average thickness for a new potato and quite edible when boiled. The size of the potatoes is average with a total yield that is slightly above average. If the potatoes are left in ground longer than 11 to 12 weeks the skins will toughen up slightly. The texture is waxy as you would would expect from a good new potato but it also has a creamy, buttery texture and taste. The flesh is light yellow. This is definitely a potato which most people will enjoy. It's well suited to boiling, salads and chips. The plants themselves grow to an average height so will only be affected by areas with stronger than average winds. Don't wait for flowers to appear as a sign that the tubers are ready because this variety only occasionally produces flowers. When it does they are normally red-violet and occasionally white. Berries are almost never produced. Good taste, reliable variety producing good looking, clean potatoes. Can be susceptible to late blight of the foliage. This is normally not a problem because they mature quickly but it can be if they are left in the ground past 12 weeks. Lady Christl is a common variety of potato which is readily available online and sometimes in garden centres. We recommend buying your seed potatoes from certified suppliers because those sold in supermarkets for consumption can be a source of disease and pest. We would avoid buying them from online general retailers such as as Amazon or E-bay unless you know exactly who is supplying the seed potatoes. Buying seed potatoes from the discount store can be a good deal but it can also result in a sub-standard crop. The discount stores take the second quality seed potatoes whereas the more specialist suppliers take the best quality. Unfortunately you will only find this out after you have carefully tended your crop for several months. 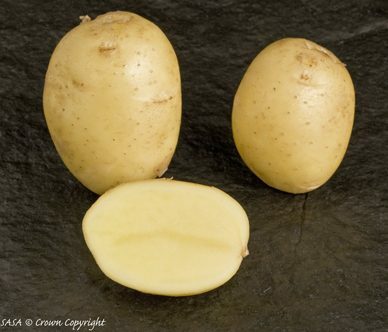 Suttons Seeds (a GardenFocused approved supplier) sell Lady Christl seed potatoes which are not only correctly certified but they are graded by size to avoid unduly small seed potatoes being sold. Click here for more information and to buy this variety online. A 1kg bag will contain about 11 good sized seed potatoes. The two primary qualities of this variety are good taste and uniform, attractive looking potatoes. Better on taste is Arran Pilot but it does not have such a long cropping potential. Pentland Javelin is worth considering, it has very similar qualities to Lady Christl. Red Duke of York and Swift are two others we would recommend. For other potato varieties which we have fully reviewed, click the drop down box below, select a variety and then click the More Information Button. The planting and harvest dates used below are correct for the UK average. If you want them to be even more accurate and adjusted for your area of the UK click here. It only takes a minute and the adjustment affects every date in this site and lasts for six months. We recommend that you start chitting / sprouting Lady Christl potatoes in the third week of February. This will give them four to five weeks to develop healthy sprouts just at the time when they are ready to be planted out. Keep the potatoes in cool but light conditions to ensure they grow short, green sprouts. Click here for our page dedicated to chitting / sprouting potatoes in the UK and Ireland. Lady Christl potatoes are an early variety of potato and they are ready for harvest, if conditions are correct, 11 to 12 weeks after the seed potatoes are planted. The key factor governing the time for planting all potatoes is the date of the last frost in your area. Even a touch of frost can damage potato plants if their foliage is above ground, an unexpected severe frost can kill them completely. The date for planting Lady Christl potato seed can be calculated on the basis that seed potatoes will take four weeks before they appear above ground. Given also that you want them to appear above ground only when the danger of frost has passed (the last week of April is the UK average) the last week of March is about right time to plant them. The harvest date for all potatoes is not only dependent on when you plant your seed potatoes, it also depends on the weather conditions throughout the growing season. But on average you can expect your potatoes to be ready for harvest some time between the second and last weeks of July 2017 in your area of the UK. This early variety can be left in the ground longer than the normal 11 to 12 weeks and it will increase in size for four weeks or so. It will loose some of the qualities of "new" potato as it turns more floury but it still makes a very good potato. The table below sets out how good or bad Lady christl potato plants are at resisting common pests and diseases in the UK. The 0 point is average with minus (red) values showing lower than average resistance and plus values (green) showing higher than average resistance. USE: Excellent all rounder for boiling, salads, chips and sautéing.